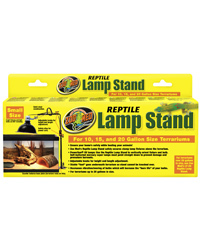 Zoo Med Repti Lamp Stands provide an easy way of positioning your lamp above your vivarium or terrarium. The Stand is designed with safety in mind, utilising a large foot to prevent it being knocked over easily and a power cord clip to keep cables out of the way. Zoo Med Lamp Stands are available in two sizes to cater for a range of vivariums and terrariums. The smaller stand will go upto 24" high and 12" across, the larger will go from 20 - 38" high and 8 - 15" across. I bought this to stand next to tortoise table but it keeps falling over. It not weighted at the base and the box says to stand my tortoise table on it but it ends up making my table wobble.